Arrow is determined to turn up the heat, and it showed this week with a measurable ramp-up in the intrigue and action in “Crossing Lines.” While season-specific story setup is obviously a matter of significant import, Arrow has been a series that prides itself on its action from the outset, and while we were only a few episodes in at this point, I was wondering when we were going to see some grade-A action scenes. Episode 3, “Crossing Lines,” does not disappoint in this regard. Oliver’s goal continues to be learning the whereabouts of gangster Ricardo Diaz, showing a firm resolve even while in his current, incarcerated predicament. Felicity’s own resolve in locating Diaz and getting her husband out of prison is the foremost, and arguably only, though in her mind. As a result, she enlists the help of her former teammates Rene and Dinah – the latter of whom isn’t exactly 100% onboard with circumventing the law in her current position at the Star City Police Department. 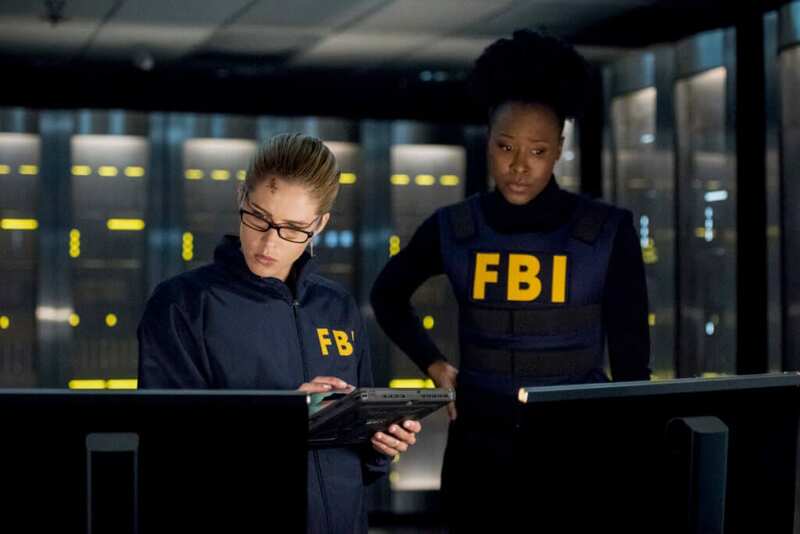 Moreover, Felicity’s resilience and tenacity proves to be too much for even FBI agent Watson to avoid relenting to, and after bugging the federal agent’s office and learning that Watson herself is frustrated with the distinct lack of progress on the Federal Bureau of Investigation’s end to find and capture Diaz, manages to obtain a “one-time” team-up with her to lay a trap for the at-large gangster and his Longbow Hunters at the CDC. “Crossing Lines” is aptly-named, as its central theme revolves around Team Arrow’s mantra of doing whatever is necessary outside of the bounds of the law in order to achieve justice – a theme we haven’t seen on full display for some time. As if an effort to make up for lost time, the theme permeates throughout the entirety of the episode, with all three mini-arcs touching on it in some way, shape or form. John Diggle encounters this when he and Lyla are on an ARGUS mission to track a black market dealer who presides over a bank. After obtaining the information they were searching for, the former Spartan discovers, through Curtis’ (who had been playing the Benji role) big nose, that Lyla made a copy of the information files they had downloaded, and he tracks her to where she’s selling them to a third party. It is only after learning the intentions of his wife, and how dangerously deep what she uncovered actually may go, that he begins to understand that in order to protect his family and achieve justice, sometimes concessions must be made and shades of grey must be painted. Oliver begins to return to his grey-area self as he is pushed further into darkness within the prison in his hunt for information. His quest puts him on the trail of a man known only as “the Demon” (which sounds a bit too distinctly similar to Ra’s al Ghul), and he learns that he must reach another level of the prison, requiring Oliver to sink deeper into darkness to find him. It is during this part of “Crossing Lines” that we get to see some great close-quarters action as performed by the always impressive Stephen Amell. Between his defending himself during a sneak attack in a cell with three other inmates and his one-on-one brawl with Samson – a fight which he punctuated with the breaking of both the man’s arms (maybe someone should’ve lent Cody Rhodes a hand? ), “Crossing Lines” is rife with Green Arrow baddie beatdowns and I, for one, am thankful for it. Felicity’s direction remains unchanged, and, while she still seems worryingly close to her whiny, season 3 maturity (or rather lack thereof), her goals and resolve are sound enough, and seeing her mentally coerce FBI agent Watson is an impressive feat in and of itself. Despite her efforts, and those of the combined forces of Agent Watson, Dinah, and Rene, they appear to fail in their attempt to capture Diaz or make any more headway in that direction. Back to “square one,” as Felicity bemoans to Watson. Felicity shows herself to be more sly and resourceful than Dinah or Rene gave her credit for being, however, as she manages to have Rene capture one of Diaz’s Longbow Hunters, Silencer, and hold her captive without the knowledge of the FBI, whisking her away right under their noses. Not bad, Felicity; not bad at all. The temporary alliance with Watson brings with it its fair share of action, and we get to see impressive bouts amongst the Longbow Hunter assassins, Rene, Dinah, and even Agent Watson, which is a nice surprise. Watson’s character seems to be going in a much different direction than she did last season (or, at least, the episode gives the appearance of such). Whether this is due to a change of heart, frustration with the dichotomy of her wanting to both do things by the book and maintain respect for the law yet still wanting to see justice served faster than fossilization, or if Felicity’s plight in having her entire family torn apart by the current events pushed her in the right direction is anyone’s guess, but it is certainly welcome character development beyond the jerk that she was in season 6. We don’t see any more flash-forwards in “Crossing Lines,” so we still lack answers in relation to William’s and Roy’s new quest, but honestly, it hadn’t been interesting enough yet for me to truly care – and most assuredly not to the level of intrigue that earlier seasons’ flashbacks brought with them. One complaint that I have so far is that everyone feels disjointed, more so than simply being split up from the team they all once had. I understand that perhaps they should feel a bit directionless, to a point anyway, as they’re likely struggling with their individual attempts to regain normalcy. But even with that, I feel many of them seem like husks. This season’s narrative is heading in an interesting direction, and I sincerely look forward to where they’re going with it; however, the presentation of the Longbow Hunter assassins makes me want to flip a table at times, as they feel like caricatures of what should be imposing operatives. That aside, the writers are holding my attention better than in some of the seasons past. Arrow is ramping up the action and intrigue with the return to a "crossing lines" mentality, and it is something that the series needed. Provided that more characters see their personalities return to them and Felicity continues to grow, the season will, in kind, continue to show promise.